Offering customers the all-you-can-eat option is rarely an unpopular move among the general public. If restaurant patrons don’t want to consume all that much, they don’t have to; but if they’re in the mood for food, they can stay until satisfied. Consider one of the latest examples: Outback Steakhouse, which began offering steak and unlimited shrimp on September 26. Outback Steakhouse has promoted the limited-time deal on national television and social media, helping boost the number of people exposed to ads for the restaurant chain. Indeed, new data from YouGov Plan & Track shows that, on September 26, 31% of US consumers aged 18+ recalled seeing an advertisement for Outback Steakhouse within the past two weeks. At present, that percentage has climbed to 38%. What’s also increased is the number of US adults open to dining at Outback Steakhouse. Since the unlimited shrimp deal debuted on September 26, the percentage of US consumers aged 18+ saying they'd consider visiting an Outback Steakhouse when next in the market for food or drink has grown from 32% to 35%, matching a high for the year. 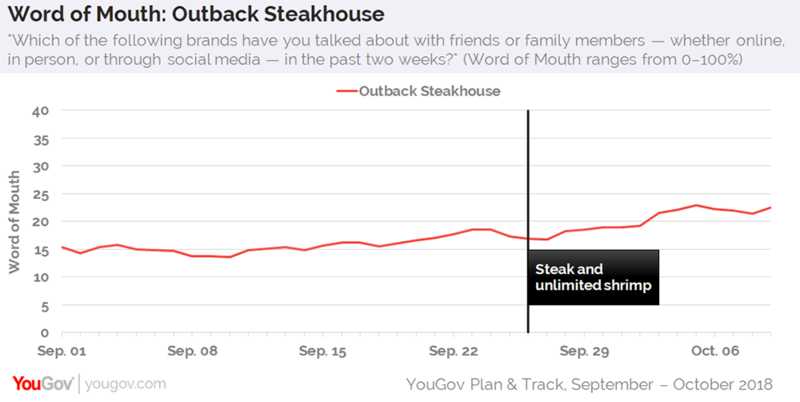 Another metric recording gains is Outback Steakhouse’s Word of Mouth score, which asks respondents if they’ve discussed a particular brand with friends or family members in the past two weeks. Since the restaurant chain began offering unlimited shrimp, Outback’s Word of Mouth score has risen from 17% to 23%. 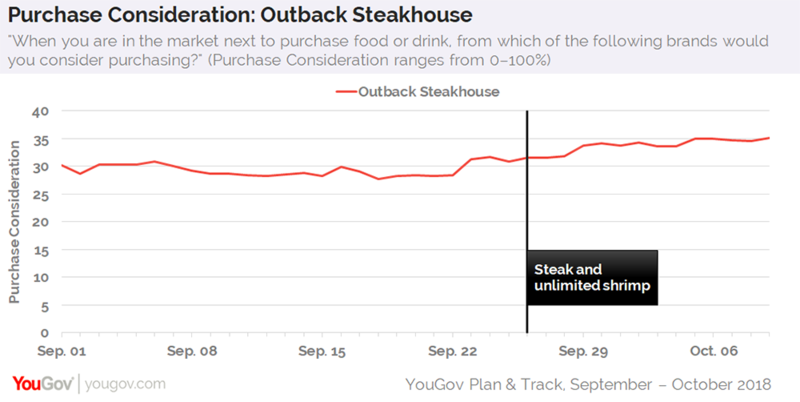 Additional data from YouGov Plan & Track reveals that 44% of current Outback Steakhouse customers tend to dine in a restaurant, cafe, pub, or other eating establishment at least once per week, compared to 36% of the general public.